Date: Wednesday, Apr. 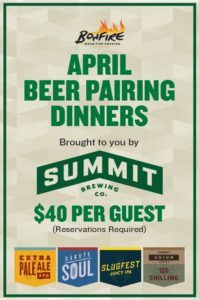 17, 2019, from 6–9 p.m.
Join the Summit brewer Tom Mondor Wednesday, April 17, at Bonfire Wood Fire Cooking in Woodbury for a four-course beer dinner expertly paired with Summit brews, including the new Summit Slugfest Juicy IPA. Price is $40 per person. To reserve your spot, call Bonfire at 651-735-0085. For more information, including food and beer pairing info, please visit https://www.facebook.com/events/389343088556542/.